Each product on sale on www.vitruviodesign.it is equipped with a detailed card, that can be seen when you click on the picture. Surf in the catalogue and when you find the product you want to buy, click on the Shopping bogie. On the right side – “Shopping bogie” – there will always be the product code, description, quantity, price and amount of what you have put in the shopping bogie. You can cancel or add a single item, or you can empty or save your shopping bogie. When you have completed your purchase, if this is your first time or in any case you decided not to have an account in the Shop, click on “register to purchase”, click on “Unregistered” fill in the form, read the terms of the personal data treatment and the terms and conditions of sale and “accept the conditions”. After having completed the registration we will send you an e-mail to confirm the registration containing the data you have included. 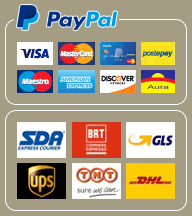 Now you will be required to choose the delivery place and the terms of payment. At this point your purchasing order will be subject “to confirmation”, and you will be provided with a shopping bogie number. At this point it will not be possible to modify your purchasing order online; to do it, you will have to send an e-mail to the address: sales@vitruviodesign.it indicating the shopping bogie number. You will receive an e-mail for receipt of the purchasing order, pay attention, it is not a purchasing order’s confirmation, (you will receive said confirmation only later, and only after all the verifications in relation to your purchasing order have been completed). After having verified the purchasing order, you will receive an e-mail of confirmation and you will be given the number of the order’s confirmation. In case you chose to have an account in the Shop in order to verify your past orders you have to enter the user name (your e-mail) and your password (the one you chose at the time of the account’s creation) and click on Login. By clicking on the link “my orders”, you will be provided with the purchasing order’s number and date, the delivery address, the status of the order’s execution and the courier; by clicking on the order’s number you will be able to see and print all data concerning the order. During the completion of the purchasing procedure some personal data will be required to carry out the delivery of the products, and you will be required to accept the treatment of said s data according to the law in force. Vitruvio S.r.l. cannot fulfill any purchasing order issued by customers which/who have not forwarded to Vitruvio S.r.l. the “approval of the personal data treatment” . Individuals younger than 18 old are not authorized, unless under the control of an adult member of their family, to forward purchasing orders by means of the on line purchasing order form. If you wish to receive an invoice, you have just to enter in the registration form your corporate name, registered office and VAT number. We remind you that the delivery place can be different from the address indicated in this form. Invoice will be sent to you by e-mail at the same time of the order execution.